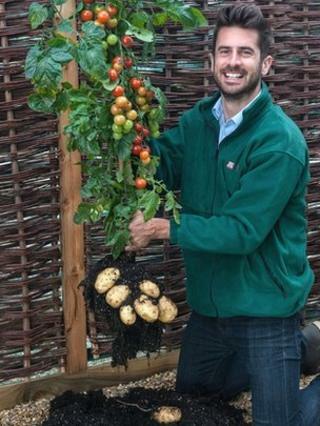 Image caption The TomTato has been described as a "veg plot in a pot"
A plant that produces both tomatoes and potatoes, called the TomTato, has been developed for the UK market. Ipswich-based horticultural firm Thompson and Morgan said the plants were not genetically modified. Similar plants have been created in the UK, but the firm said it was thought to be the first time they had been produced on a commercial scale. Guy Barter, of the Royal Horticultural Society (RHS), said it was looking at the plant with "real interest". Mr Barter said many of these plants - created by a technique known as grafting - had been created before but taste had previously been a problem. "We're looking at it with real interest because Thompson and Morgan are a really reputable firm with a lot to lose, but I wouldn't rule out that it could be a very valuable plant to them," said Mr Barter, who is a contributor to BBC Gardener's World. "In the past we've never had any faith in the plants - they've not been very good - but grafting has come on leaps and bounds in recent years. "Many people don't have that much space in their gardens and I imagine this sort of product would appeal to them." Thompson and Morgan director Paul Hansord claimed the tomatoes were tastier than most shop-bought tomatoes and said the plant had taken a decade of work. "It has been very difficult to achieve because the tomato stem and the potato stem have to be the same thickness for the graft to work," he said. "It is a very highly skilled operation. We have seen similar products. However, on closer inspection the potato is planted in a pot with a tomato planted in the same pot - our plant is one plant and produces no potato foliage." It added both ends of the plant had been tested for alpha-solanine - a poison that can be produced in both crops depending on growing and storage conditions - and it had been certified as safe. A similar product, dubbed the "Potato Tom", was launched in garden centres in New Zealand this week.